Roll and 35mm film versions first appeared in 1941 and were initially slower at 125 ASA (equivalent to 250ASA in the post-1960 speed rating system). Cut Film (sheet film; flat film) appeared in 1943, also initially at 125ASA. See the Ilford Speed Group 'F' designation rather than the 'G' of plates lower down. 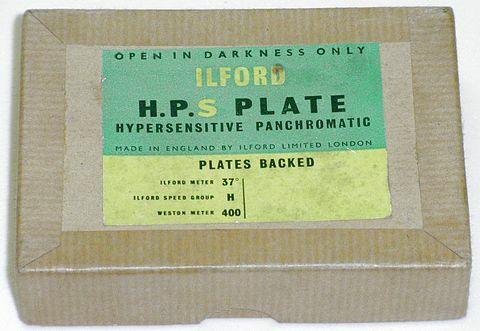 Plates first appeared in 1942 and were immediately at the 'usual' HP3 speed of 200 ASA = Ilford Speed Group G (400ASA/ISO in the post-1960 speed rating system). All HP3 emulsions became 200ASA (equivalent to 400ASA post-1960) around 1955 (maybe 1954). This image sent to me by Jim Fisk of the Great Yarmouth Photographic Society (see the bottom of this web page) and friend of Paul Godfrey. He says "It came from the Charlie Read collection". The expiry date of these 35mm films for darkroom loading into (especially) Leica cassettes was July 1948. 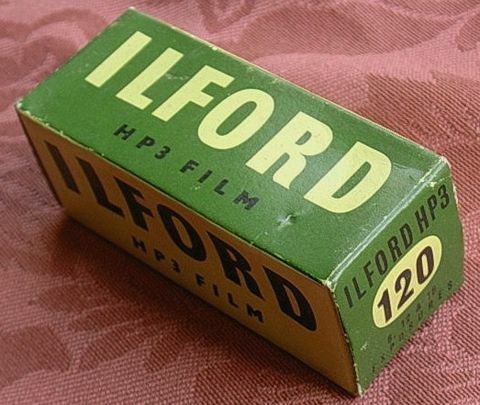 The packaging lacks the Paddle Steamer trademark, which was 'dropped' in 1945, so it seems this pack was made around 1946, meaning it was one of the last packs of film refills made with the 'Selo H.P.3' name. 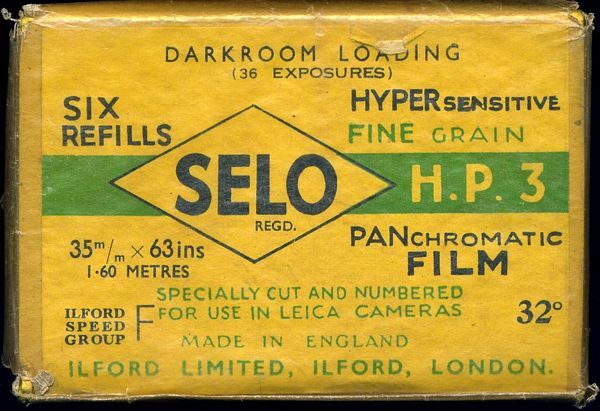 Shortly after 1946 the name 'Selo' seems to have been dropped by Ilford and the film became just H.P.3. In another couple of years it was named simply HP3, i.e. no stops between the letters. 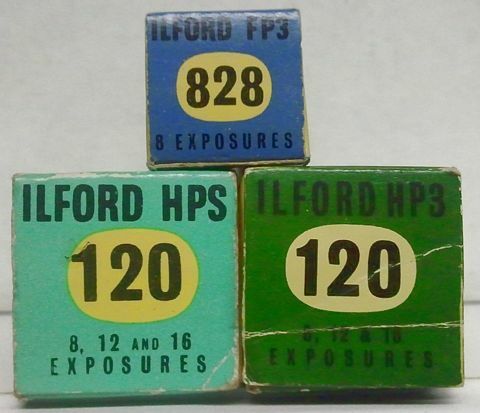 The original instruction booklet for the Ilford Exposure Meter Model B (on its page 8) shows that, even at the time the booklet was produced (March 1938), the Ilford Speed Group range had already increased to include the letter 'F', necessitated by "the recent increase in speeds of Ilford Hypersensitive Panchromatic Plates and Films". 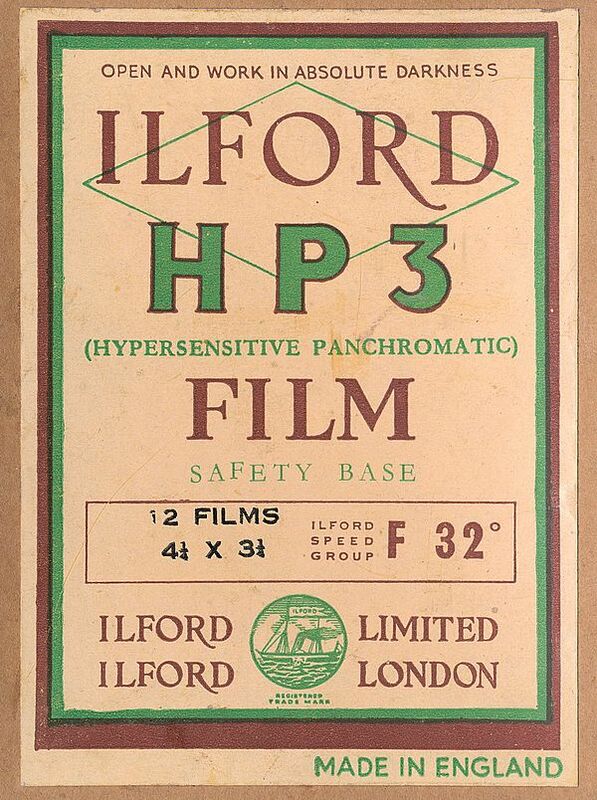 This presumably refers to H.P.2 becoming available in the 35mm format in 1938. HP3 35mm film from the early 1960s (expiry date October 1965). Because of its post-1960 manufacture, the speed is now 400ASA (ISO). No actual sensitivity increase, just a re-appraisal of how speed should be rated, as was adopted by all b&w film manufacturers at that time. This box and cassette did not belong together originally, as the box refers to 20 exposures and the cassette to 36 exposures. 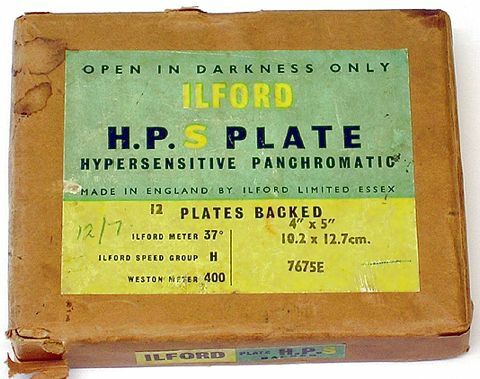 This box of HP3 Matt sheet film was manufactured pre-1955, as the Weston speed is given as 125 Weston (=ASA=ISO). 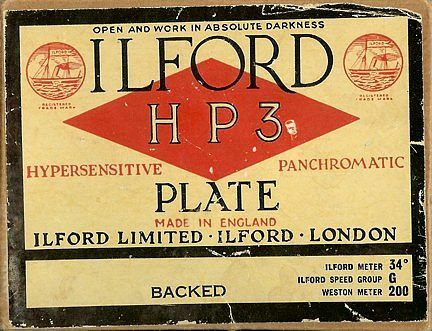 Ilford increased the speed of all HP3 film emulsions to 200 Weston in 1955 to bring the speed in line with HP3 plates. As with HPS, experienced photographers could expose HP3 at 400 ASA (ISO) when developing in most of the Ilford film developers, ID-48 being the exception, with Microphen giving a slightly higher speed increase to 650 ASA (ISO). 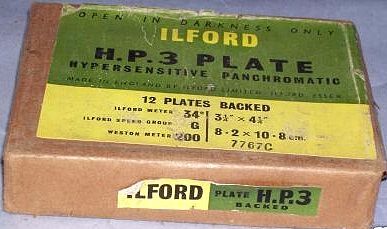 This box contained HP3 Matt film, which had a matt finish on the non emulsion side, giving the processed negatives a soft, flat appearance, although the contrast was not altered by the matt finish. The purpose of the matt finish was to give a surface for re-touching of the negative in pencil or dye, as might be required for portrait negatives. It was much easier to re-touch in pencil onto a matt surface which would otherwise have been glossy. 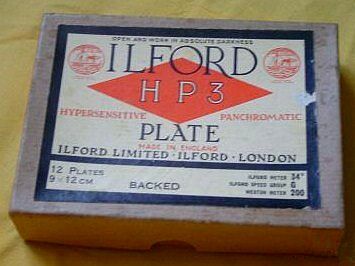 HP3 films and plates were widely used for portrait photography in the 1950s and 1960s. Box of HPS Sheet Film (Flat Film, Cut Film) dating from 1956 onwards. 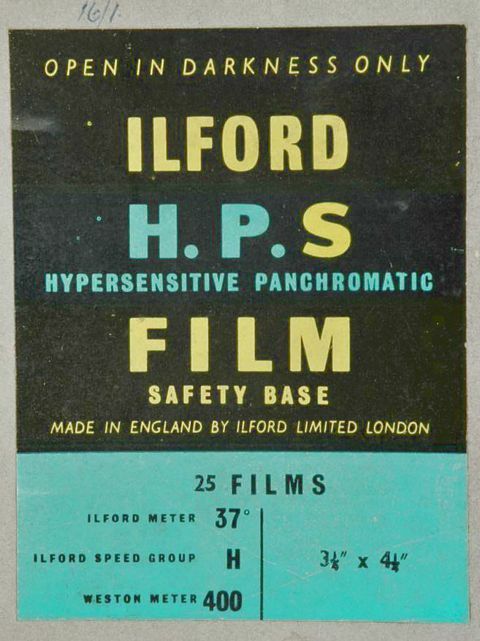 HPS sheet film was introduced in 1953, a year after HPS Plates (and a year before HPS Roll and 35mm Film), making it the fastest Sheet Film in the world at that time at 400 Weston (=ASA=ISO; note that this speed equivalence was only true after introduction of the Weston Master III exposure meter in 1956). 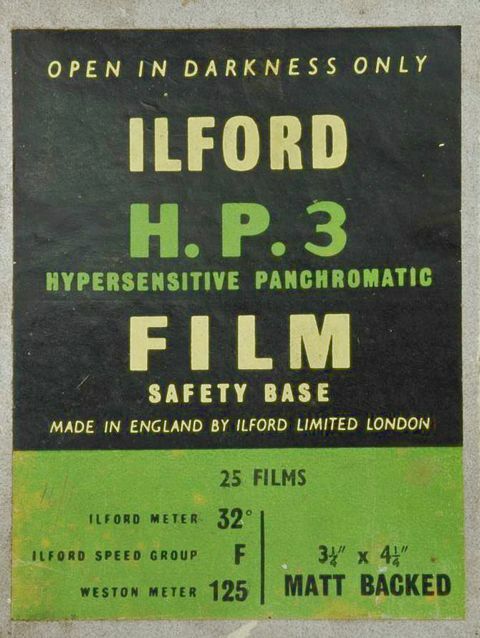 The 400 speed rating included a Safety Factor of one stop, and experienced photographers processing their own films could safely expose HPS at 800 ASA (ISO) when using the Ilford developers ID-2 or ID-11, but not ID-48. ID-48 was an Extra Fine Grain developer, and its extra fine grain development decreased the emulsion speed by half a stop. A further gain in speed was possible by developing the film in Ilford Microphen developer when the film speed could be increased to 1,200ASA (ISO). Some photographers found they could expose at even higher speeds with extended development times in Microphen depending on the amount of shadow detail required. The HPS box dates from pre-1957, because it is labelled Ilford Limited London. After 1956 this became Ilford Limited Essex. Manufacture of HPS film in all formats ceased by 1971, but it was still possible to find out dated boxes of HPS sheet film offered for sale at surplus photographic material dealers, such as A.W. Young, Marston and Heard, plus others, in the late 1970s.